This tough armor prevents the spiders from desiccation as they often live in arid zones. These tiny creatures, only 1 – 2.5 mm long are barely detected as they live hidden beneath litter or under bark. They are also called 6 eyed dwarf spiders as they have only 6 eyes and some species are even blind. Opopaea stanisici Baehr; showing the male holotype with the swollen palpal patella (Fig. J) that characterizes the genus Opopaea. Photographer: Barbara Baehr, copyright Queensland Museum.. These 71 new species belong to the genus Opopaea, also known as ‘jelly bean’ Goblin spiders, because a part of the male sexual organ looks like a little orange-brown jelly bean. 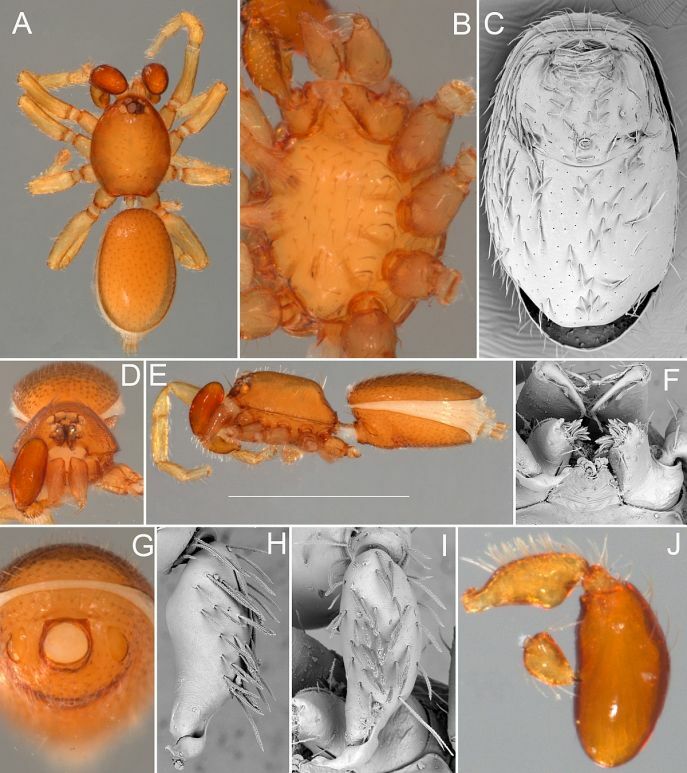 This genus has been revised as part the international Planetary Biodiversity Inventory project to study the systematics of goblin spiders worldwide. This work increased the number of described Opopaea species in Australia from 13 to 84. 13 of the new species are from Queensland including O. ameyi, O. brisbanensis, O. broadwater, O. carnarvon, O. carteri, O. chrisconwayi, O. douglasi, O. lambkinae, O. leichhardti, O. mcleani, O. proserpine, O. stanisici and O. ulrichi. The Planetary Biodiversity Inventory project supports collaborations between researchers at different institutions over the internet database which is an effective way to tackle large projects. The leading author is Dr Barbara Baehr from the Queensland Museum in Brisbane who described all 84 species; other authors are Dr Mark Harvey from the Western Australian Museum who is the regional coordinator for the Goblin spider PBI, Dr Ricardo Ott, from the Museu de Ciências Naturais da Fundação Zoobotânica do Rio Grande do Sul in Brazil and Dr Helen Smith from the Australian Museum in Sydney who is recognized with joint authorship on six species from NSW in the overall paper. The illustrated species, Opopaea stanisici is named for Dr John Stanisic, ‘the Snail Whisperer’, former senior Curator of the Queensland Museum, land snail researcher and Principal Biodiversity Scientist of BAAM (Biodiversity Assessment and Management) who conducted the Redlands Shire survey where this species was discovered. The Holotype was collected by Dr Robert Raven Senior Curator (Arachnida) & Head of Terrestrial Environments of the Queensland Museum in leaf litter of scribbly gum open forest, on the 19 February 2009 and deposited in the Queensland Museum Spider Collection (QM S86904, PBI_OON 23405). Figure J shows the jelly bean like swollen patella of the male palp.